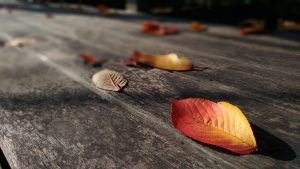 Low Maintenance Decks Protect Against Winter. As the weather changes and starts to cool, preparing your home for winter come front and center. Ensuring that home and property are ready for the snow and ice are part of regular home fall maintenance. Making sure your deck is ready for winter should be on that list. Weather Damage on your deck can get worse after a harsh winter. Call Miles Bradley for help. The snow, ice, and fluctuating temperatures takes its toll on any material. If you have an unsealed wood deck it takes the brunt of what nature throws at it. Even if you sealed your deck any flaws in the wood or cracks that weren’t properly filled are in danger of damage. When the wet snow gets into the nooks and crannies of your wood deck then freezes, the damage begins. We see it with the roads here in the Midwest every year. After a few seasons of this, your deck will be unusable and will need to be replaced. For some homeowners who have a long-term vision, getting the deck that can handle the weather is better than replacing it down the road. These homeowners are the ones who pick composite decking material over traditional wood. With composite decking from companies like Trex, you’re ensured longevity and protection from the elements. Composite decks are easily cleaned, don’t need to be resealed every few years, and can handle the inclement weather. If your deck has been looking a little worse for wear, consider replacing it with composite decking. Here at Miles Bradley, we are a platinum-certified Trex deck contractor, and we take pride in that. We can help replace your old deck with a new composite material before the winter sets in. Even if it’s late in the fall, we will build your dream deck. We work all over the Metro Detroit area in cities like Royal Oak, Farmington Hills, and Ann Arbor. Contact us today for a free quote and to hear about what our offseason deck building deals are.